Show your legs without varicose veins! 500Cosmetics Legs Pill is for the leg circulation that helps reduce varicose veins in a 100% natural way and prevent their appearance. 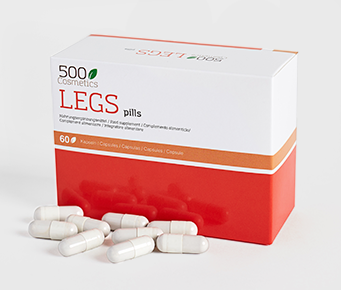 500Cosmetics Legs Pills, is the food supplement composed of natural ingredients that works as a remedy for varicose veins. With its highly effective nutrients, these pills for the circulation of the legs provide the necessary in the veins to reduce and prevent the appearance of varicose veins, reducing fatigue, heaviness and improving the appearance of the legs. To improve circulation and relieve leg discomfort from varicose vein, we recommend Varesil Cream. 500Cosmetics Legs Pills, is for varicose veins treatment that strengthens the walls of veins improving the tone of the muscles. In addition, it prevents hemorrhages way in our organism. This treatment for varicose veins has natural ingredients that help improve blood circulation by eliminating the most recent varicose veins, as well as reducing fatigue, swelling and heaviness in the legs. Take two pills of 500 Cosmetics Legs Pill daily and you will begin to notice results in improving circulation and decreasing varicose veins. Dosage: Two tablets should be taken daily. 500Cosmetics Legs Pills works as a food supplement is not recommended to ingest it in quantities greater than the recommended dose because it can be counterproductive. When it should be taken: It is recommended to take 500Cosmetics Legs Pills in the morning and at night. 500Cosmetics Legs Pills can be combined with Varesil Cream varicose cream for best results in reducing pain and swelling. Aesculus hippocastanum (Horse chestnut): Is used to treat phlebitis, varicose veins, hemorrhoids and vascular problems for their flavonoids. Pinus pinaster: Pine bark extracts which improves microcirculation by increasing capillary permeability. It protects the walls of blood vessels and improves blood flow. Ruscus aculeatus (butcher’s broom): Improves the venous circulation in weak, tired legs. Piper nigrum: Black pepper extracts which beneficially acts on the heart and cardiovascular system. It facilitates the absorption of all other components more quickly and efficiently. Hamamelis virginiana (African witchhazel): Soothing haemostatic pain reliever. Is it necessary to be of legal age to consume varicose veins 500Cosmetics Legs Pills? Yes. It is necessary to be over 18 years old both for your purchase and for the consumption of this treatment. Is it safe to ingest this food supplement for varicose veins? Yes. Its composition is made up of totally natural herbal extracts, so its intake does not pose any problem for health, as other food supplements of the range. Is a medical prescription required for the acquisition of this treatment for varicose veins? No. 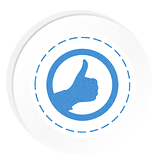 Being a natural product to prevent varicose veins, it does not require medical approval. Is there any contraindication in the intake of the pills to prevent varicose veins? No. it is not recommended for pregnant or breastfeeding women, also not advisable for those with high blood pressure problems, antidepressants or those who are under psychological treatment. No. It is a natural product so you should only take into account not being allergic to any of the components of the formula of these treatments. Can it be combined with other methods for the prevention of varicose veins? Yes. The ideal is to combine it with Varesil Cream for varicose veins to obtain faster results.